NIKKEN MAGDUO MAGNETIC MASSAGER NEW MODEL MAGBOY #13201 WORLDWIDE SHIPPING! Note: Above video is for instructional reference only. For example: The Magduo in the video has moveable magnets (which were prone to falling out!). The Magduo I have for sale here has fixed magnets which are more effective and do not fall out! 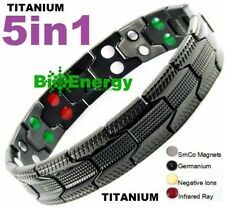 TITANIUM steel Anion Germanium Magnetic RED Far Fir JADE. Benefits of Germanium ( Black stone). 5 in 1 Bio Bracelet. - Enhance physical ability,keep yonth and good health, with more vitality. Proudly presents quality Nikken products at a great price. FEATURED NIKKEN TECHNOLOGY. TriPhase Technology (Far Infrared, Magnetic, Negative Ions), Patented DynaFlux® Magnetic Technology (U.S. Patent No. 9,265,966). TITANIUM steel Anion Germanium Magnetic RED Far Fir JADE Copper Dead sea minerals. Benefits of Germanium ( Black stone). 7 in 1 Bio Bracelet. - Enhance physical ability,keep yonth and good health, with more vitality. The resonance and vibration of spinning frequencies of the QBP ALPHA SPIN ENERGY™ is transferred through water, light or air. It is believed that the natural resonance of QBP ALPHA SPIN ENERGY™ is similar to that found in many water springs around the world, including BAMA, an internationally recognized longevity village in China. TITANIUM steel Anion Germanium Magnetic RED Far Fir JADE Copper Dead sea minerals. Benefits of Germanium. Bio Stone ION Anion Benefits. improve body cell activity and body immunity. 7 in 1 Bio Bracelet. TITANIUM steel Anion Germanium Magnetic RED Far Fir JADE. Benefits OF GERMANIUM. improve body cell activity and body immunity. 5 in 1 Bio Bracelet. - Enhance physical ability,keep yonth and good health, with more vitality. ((1) Pulse Generator (eroPulse) with Energy Pad Tester built-in. eroPulse Specifications Blood flow along with enhanced protein synthesis in cells aid in reducing pain, swelling and inflammation. 1) How often should I use eroPulse?. EarthPulse Sleep on Command System. Condition is Used. Shipped with USPS First Class Package. PEMF Therapy PORTABLE PEMF THERAPY PAD OMI Pulse Pad - Portable, Affordable! Friends, I have studied biomagnetic therapy and pulsed electromagnetic field therapy for many years. The OMI PulsePad was the answer! Just so you know the PulsePad is a quality and functional PEMF system, I have taken photos to verify the pulsed magnetic fields coming off the PulsePad. Bio Magnetic Bracelet. 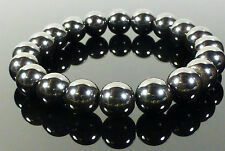 TITANIUM Strong Magnet 3000 Gauss Bracelet. Very strong 3000 Gauss Magnet all 100% Genuine! 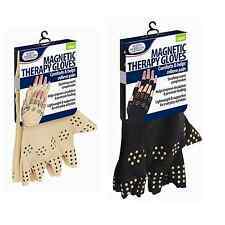 Types of pain that magnetic therapy: help are. in Black Matte finish. Bracelet Length 21cm, Width 15mm. 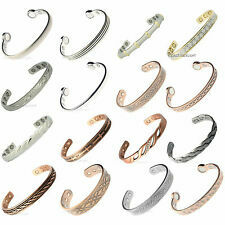 Magnetic Bracelet Copper 99.9% Bio Therapy Chronic Pain Relief Arthritis Healing. Quality: nickel and lead-free. Rinse with warm water and dry the design thoroughly before storing the bracelet. TITANIUM steel Anion Germanium Magnetic RED Far Fir JADE Copper Dead sea minerals. Benefits of Germanium. Muscular pain, Inflammation of joints. 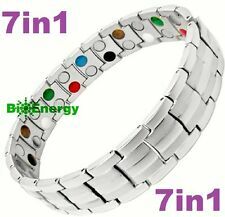 7 in 1 Bio Bracelet. - Enhance physical ability,keep yonth and good health, with more vitality. Improve body cell activity and body immunity. 7 in 1 Bio Bracelet. - Enhance physical ability,keep yonth and good health, with more vitality. TITANIUM steel Anion Germanium Magnetic RED Far Fir JADE Copper Dead sea minerals. Our products are made in the USA. Our magnetic products are not sold to cure diseases. Magnetic therapy is not intended to replace any instructions, prescriptions or directions prescribed by your doctor. NIKKEN KENKO MAGDUO - Replaces Magboy! FREE SHIPPING!!! Newest version, this is the Kenko Magduo with TriPhase Technology. Item #13201. The pillow case is an ancillary product to the pillow. Complete your Kenko Sleep System with the Naturest Custom Pillow case. Designed to fit standard-size pillows and the Naturest Custom Pillow, special fibers comprising the Custom Pillowcase provides warm or cool temperature regulation that’s just right. Proudly presents quality Nikken products at a great price. FEATURED NIKKEN TECHNOLOGY Magnetic Technology, 800 gauss. • 700-900 gauss high-quality neodymium magnets extend coverage throughout the length of the necklace. The quilted, comfortable mattress pad fits on top of your mattress and under your fitted sheet to project a north-pole field along your entire body. Suggested to help improve circulation, reduce inflammation, and can help to soothe aches and discomfort. Nikken PiMag Optimizer II Pi Ring. The Nikken PiMag Optimizer II includes a display function that shows how much you have used your Optimizer, in the number of hours it has run. Press the Mode button again and hold down. EHM 4th Generation Quantum Magnetic Resonance Body Analyzer® | Non-Invasive, Whole Body Health Scanner | 48 Reports In English & Spanish. Introducing The EHM 4th Generation Quantum Magnetic Resonance Body Analyzer®. Book "The Biomagnetic Pair"Dr. Isaac Goiz D. for the Biomagnetism sessions. The maximum potency of magnets for the use of Biomagnetism or Trapped Emotions should not exceed 20,000 gauss or a Pull Force of 60 lbs. Q-Link SRT-2 Pendant: Black, The Original EMF Protection Pendant. I and my Partner have been wearing this pendant for years. We firmly stand with they work! We have noticed increased concentration and energy. When we take our pendant off, we notice a difference in the way we feel. PEMF Device Magnetic Therapy, Pulsed Magnet Field "MAG-30"
To eliminate violations, the body needs comprehensive support, which Mag 30 is ready to provide. MAG increases the resistance of the body to the occurrence of various diseases, and also does not have any significant side effects. Bioflow Magnetic Bracelet - Duet Large. The powerful field of each Bioflow magnet is thought to improve blood flow to areas of pain or injury, encouraging healing and cell regeneration. Bioflow products should not be worn by anyone fitted with a heart pacemaker or other implant that could be affected by a strong magnetic field. Proudly presents quality Nikken products at a great price. FEATURED NIKKEN TECHNOLOGY Nikken Magnetic Technology, 700-900 gauss spread throughout necklace. • 700-900 gauss high-quality neodymium magnets extend coverage throughout the length of the necklace. Die fortschrittliche EQL-Magnettechnologie erzeugt ein völlig regelmäßiges magnetisches Muster und damit ein präzises, einheitliches Magnetfeld. Sie hat eine Länge von ca. 96 cm. Davon muß man 7 cm für die Überlappung des Klettverschlusses abrechnen, damit die Bandage paßt. Die Bandage stützt den Rücken gut. Ich nutze sie selbst und kann sie nur empfehlen. NIKKEN PIMAG WATERFALL WATER SYSTEM NOT INCLUDED. Proudly presents quality Nikken products at a great price. The powerful field of each Bioflow magnet is thought to improve blood flow to areas of pain or injury, encouraging healing and cell regeneration. Bioflow products should not be worn by anyone fitted with a heart pacemaker or other implant that could be affected by a strong magnetic field. NIKKEN POWER CHIP MINI MAGNET. THE OLD GOLD MINI (WITH WHITE PAD #1425) DOES NOT HAVE THE "EQL" TRIANGLE EMBLEM UNDER THE NIKKEN EMBLEM. THE NEW GREEN, RED OR BLACK POWER CHIP MINI LISTED HERE HAS TAKEN ITS PLACE. Wearable system that synchronizes your mind and body, powered by your smartphone. Elf emmit is almost magic. The elf emmit application offers 5 programs that allow you to achieve the following desirable mind stages: SLEEP, MEDITATION, ANTI-STRESS, INCREASED CONCENTRATION and SUPER LEARNING. Elf emmit simply take into account what is already known about the different frequencies at which the brain operates and simply suggest that if function at the desired frequency. Sie hat eine Länge von ca. 120 cm. Davon muß man 6 cm für die Überlappung des Klettverschlusses abrechnen, damit die Bandage paßt. Die Bandage stützt den Rücken gut. Ich nutze sie selbst und kann sie nur empfehlen. PEMF Therapy OMI PEMF Therapy PulsePad - Portable, Affordable PEMF System!